Why a happy reader? Many children learn to read; not all of them have a good time doing it though. A reader who enjoys the process is more likely to make reading a life-long pursuit rather than just read when she has to. Here are some ideas that can help your child become a reader who loves to read. Talk and listen to your baby: Current research shows that babies absorb much more from simply listening to your words than was previously thought. When you talk often and clearly with your child (that includes listening to her thoughts as well) you’re giving her an early start towards a love of words and sounds. Read together: This one’s a given. But with time demands; work, chores, meals, and more, family reading time can often be compromised for other tasks. I’ve run out of time in the day and not been able to sit down with my son and read — maybe you’ve done this too. Parents aren’t always perfect, still, each day try to spend at least 30 minutes reading with your child. The dishes can wait — really, they’re not going to walk off (no matter how hard we wish). Make book hunting an adventure: The smell of old books and hunting for 25 cent books can be so much fun. Take your child book hunting often. Try the library, new and used bookstores, garage sales. Make it a big deal when you find a great book. Your child will grab onto your excitement. Read aloud: This isn’t the same as reading with, or to, a younger child. 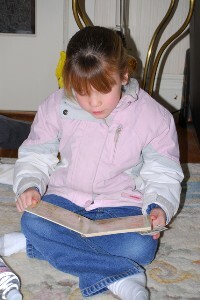 As your child masters reading skills let her read to you. My mom worked all day when I was young. She was pretty busy. Something good I remember about those busy days is that each night while she cooked dinner, I’d read to her; first Pippie Longstocking, and then other, tougher books. The part I remember most is that she seemed actively engaged in the story — which may be the key to this tip. When your child reads to you, laugh, ask questions, let her know you’re listening and benefiting from her reading to you. And don’t make this time about correcting her skills — just let her read and have fun. Other ideas: Draw pictures with letters, write words, make your own books, get some books in various languages, and listen to books on tape. Tips adapted, in part, from The U.S Department of Education. We have become pretty crochety and cranky, my husband and I… Not so much with each other - mainly with the kids. I think what started as us feeling like we had to set some ground rules with our son (which was, at the time, very important) kind of grew into this monster of us being nay-sayers to any fun that might be had. I found myself walking around with a sneer most of the day and, when I would catch glimpses of myself in the mirror I felt as if I was looking at Bette Davis in What Ever Happened To Baby Jane? Pale, crazy, hair all mussed - I just didn’t wear grouchy well. It was putting us all in quite a nasty little funk. The kids weren’t having any fun and we certainly weren’t having any fun. So, this past weekend and yesterday we just made a very pointed decision to freakin’ relax. We had gotten so caught up in being disciplinarians that we forgot that we loved having fun with each other. It took saying yes at times when we would habitually say “no” - you know, those unimportant things like “can I play in the hose outback?” or “can I stay up a little longer?”… I don’t mean instigating a free-for-all.. We are just picking our battles and chilling out a significant amount and everyone, from the kids to the pets to the parents, are much happier for it. Your child’s capacity to understand death - and your approach to discussing it - will vary according to your child’s age. Each child is unique, but here are some rough guidelines to keep in mind. Until kids are about 5 or 6 years old, their view of the world is very literal. So it’s a good idea to explain the death in terms that are basic and concrete. If the person was ill or elderly, for example, you might explain that the person’s body wasn’t working anymore and the doctors couldn’t fix it. If the person dies suddenly, like in an accident, you might explain what happened - that because of this very sad event, the person’s body stopped working. You may have to explain that “dying” or “dead” means that the body stopped working. Kids this young often have a hard time understanding that all people and living things eventually die, and that once a person dies, it’s final and that person isn’t coming back. So even after you’ve gone through this explanation, your child may continue to ask where the person is or when the person is returning. As frustrating as this may be for you, continue to calmly reiterate, in concrete terms, that the person has died and can’t come back, and that your child won’t be seeing him or her again. This article has offered us alot of insight as to how my son might be interpreting all of this. I have a friend, her name is Joy, who is always a wonderful person to bounce parenting problems and solutions off of. She is very concientious about her methodology and her tactics when it comes to disciplining her two daughters (one of which my son has been madly in love with for the last two years). She has been reading a book “How to Talk So Kids Will Listen & Listen So Kids Will Talk” - it is a kit to engage parents in a relationship that their children will understand and in a relationship that they can be themselves in. How to Talk So Kids Will Listen and Listen So Kids Will Talk is an excellent communication tool kit based on a series of workshops developed by Adele Faber and Elaine Mazlish. Faber and Mazlish (coauthors of Siblings Without Rivalry) provide a step-by-step approach to improving relationships in your house. The “Reminder” pages, helpful cartoon illustrations, and excellent exercises will improve your ability as a parent to talk and problem-solve with your children. The book can be used alone or in parenting groups, and the solid tools provided are appropriate for kids of all ages. –This text refers to the Paperback edition. If your children are anything like mine and Joy’s and they thrive on decision making and being the leader of the house then it sounds like this book will help bring a sense of balance.